Posted on Thu, Mar 22, 2012 : 12:14 p.m.
University of Michigan's study of stem cells continues to cause tension between the Ann Arbor school and the Republican-controlled state Legislature, the Detroit Free Press reported Thursday. 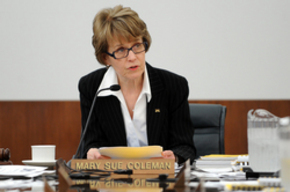 Republican members of the Michigan House Appropriation Higher Education Subcommittee last week slammed U-M President Mary Sue Coleman for not, in their view, adequately responding to requests for information about embryonic stem cells. The Free Press reports that Legislature asked all state universities to disclose the number of embryonic stem cells used in its research. As U-M is the only university to conduct embryonic stem cell research, the school filed a lengthy report on its research in December. GOP lawmakers say that report does not include the number of embryonic stem cells and accused U-M of "thumbing ... their nose" at the subcommittee. In response, Coleman told the committee that the report conveyed the depth of U-M's research in a way that raw data couldn't. Read the full Free Press article here. Sat, Mar 24, 2012 : 3:21 p.m.
Fri, Mar 23, 2012 : 7:08 a.m. The problem is that the level of scientific understanding is low for those in the state legislature (regrettably, in U.S. citizens overall). Also, there is a lot of mis-information on this topic. Just throwing out numbers, without providing context and some basic scientific explanations, would be reckless in this climate. Overall, the GOP is clearly attacking the university. Stem cell research passed various legal tests and protections for it were added to our constitution in 2008 (Proposal 2). Therefore, it's not really relevant how many are used. It's only relevant if you have a political agenda. Thu, Mar 22, 2012 : 8:56 p.m.
&quot;The Free Press reports that Legislature asked all state universities to disclose the number of embryonic stem cells used in its research.&quot; Just do it. Fri, Mar 23, 2012 : 2:29 a.m.
No other state university in Michigan is performing any such stem cell research and these Republican clowns, with their wacko agenda, damn well know it. Thu, Mar 22, 2012 : 6:44 p.m. Regardless of how you feel about the stem cell issue, this is just another example of how the UM thinks that the only responsibility the legislature has to do with UM is to write a check. Otherwise, we are autonomous in the constitution. No other state give their universities that much autonomy. UM is fighting hard against HB5000 which would only establish a commission to study the governance of the state universities. By the way, the Regents voted last month to change the Regents' bylaws to allow President Coleman to serve past 70 years old, saying that the General Counsel's Office said it was illegal age discrimination. Do you know who else does not allow their members to run for office after 70? The State courts. No state court judge can run for re-election after age 70. If it is illegal age discrimination don't you think the courts would know about it? I've said it before and I'll say it again. Embryo's are frozen solid for at least five years in some cases. There is not one documented case of a human being frozen solid for any amount of time and then is able to be reanimated. THEREFORE...the conclusion is that embryo's are not human life. They don't have a soul, or feelings, even though it may be living tissue. Repubicans, in my opinion, should get off their high horse. Thu, Mar 22, 2012 : 6:09 p.m.
Don't hold your breath waiting for Rick Snyder to stand up to these 18th Century creeps who have taken over the Republican Party. Thu, Mar 22, 2012 : 4:51 p.m. There is no doubt stem cell research if valuable and has lead to a number of discovers. However what is the results on Embryonic Stem Cells. Our we arriving at the same benefits. If we are going to kill children to obtain these types of stem cells should we not have results for them. Or are we going to be like the doctor in charge of research in Germany during WWII. Killing people because they have no value just to see why they bleed. making useful things from their body parts did not justify the murder of 6 million. And yet we ignore, like the citizens of Germany, the butcher of Innocent lives because of a pipe dream. It is time the U gives us some answers into their research. Thu, Mar 22, 2012 : 5:10 p.m.
What children do you think are being killed? The embryos, about 50-150 cells total, would have been destroyed as unused from in-vitro fertilization procedures. To put that into perspective, a fully grown adult sheds about 30,000 skin cells per hour. I respectfully suggest you should do some more research on this topic.